The Forest of the Butterflies, by Luis Enrique Hernandez of Xalapa, Mexico, is one of the 2019 Winter Stations art installations on display at Woodbine Beach until April 1. Photo by Rushanthi Kesunathan. 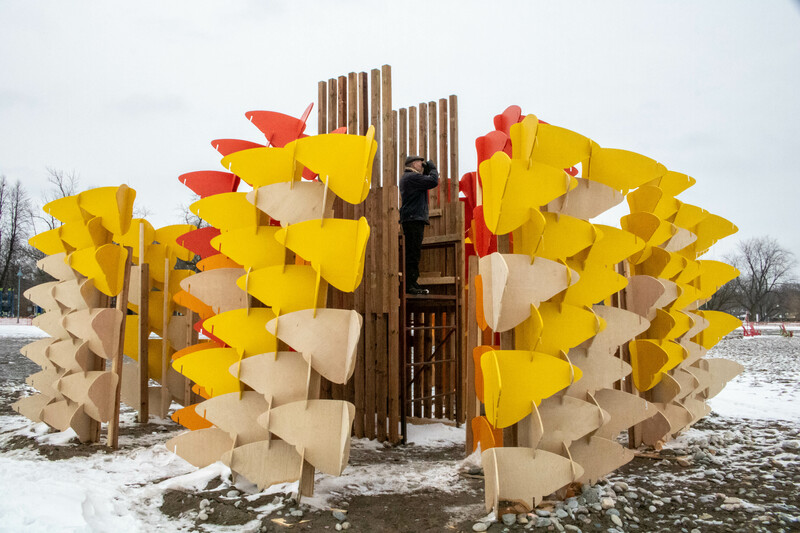 Children and their families are invited to take part in a guided tour of the Winter Stations art installations on Woodbine Beach this Sunday and also create their own art as part of a Pop-up Shop event hosted by East End Arts and Small Print Toronto. The guided tour begins at 1 p.m. sharp on March 24, and participants will meet on the boardwalk in front of the Donald D. Summerville pool, 1867 Lakeshore Blvd. E.
Everyone is invited to take part in the tour with staff members from Small Print Toronto, which is an organization that encourages young people to tell their own stories. After the tour, East End Arts hosts a Pop-Up Shop featuring family art activities at 1961 Queen St. E., at Kenilworth Avenue. At the Pop-Up Shop, youngsters can create their own miniature Winter Station using recycled materials and craft supplies provided by East End Arts. Though supplies will be provided, the organizers are encouraging participants to ring their own cleaned recycled materials to help explore different textures and ways of creating and building art. For those who don’t wish to take part in the art activity, Small Print Toronto is also encouraging young participants to act as media observers for the afternoon’s activities. They can take on the roles of aspiring reporters, writing small articles and drawing illustrations about their Winter Stations experience for The Mouse City Times – which will be the day’s paper of record. Children taking part in the tour or the Pop-Up Shop must be accompanied by a parent or guardian at all times. There is no cost to take part in either the guided tour or the Pop-Up Shop activities.